Bring out your inner child this Halloween with a Minnie Mouse look! 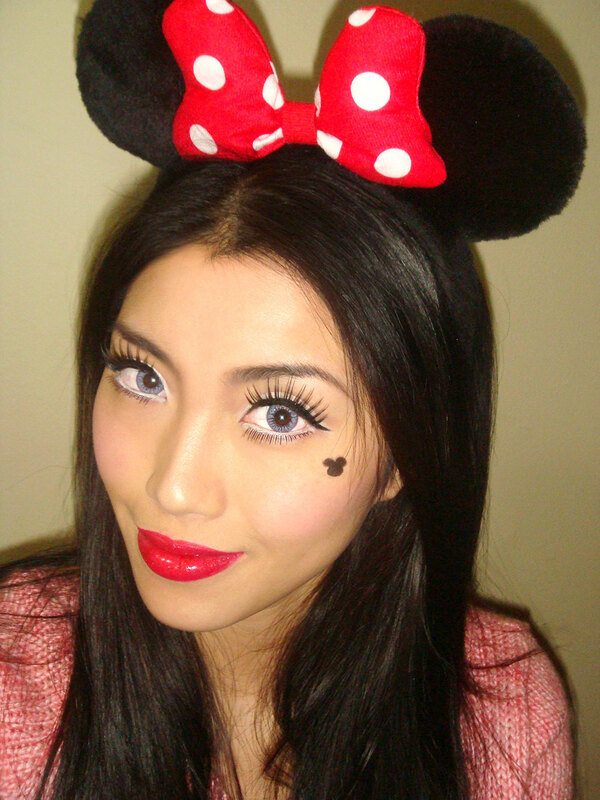 All you need is a pair of Minnie ears, red lips and my must have for Halloween, fake eyelashes! Start by evening out your skin with foundation. Add concealer and powder as needed. Sweep a matte baby pink blush from the Pixi Holiday 2011 Ultimate Beauty Kit onto the apples of your cheeks for a dolly look and add a shimmery light beige powder down the nose to highlight. Using a liquid liner like the Jealousness Waterproof Eyeliner in Smoked Black BK-II, carefully draw on a Micky Mouse beauty mark right above your cheekbones. Fill in the eyebrows with a dark brown eyeshadow from the Pixi Holiday 2011 Ultimate Beauty Kit. Then, prep the eyelid with NARS Pro Prime Smudge Proof Eyeshadow Base. Using a dense eyeshadow brush like MAC 239 Eye Shader Brush, pat a matte white eyeshadow from the Pixi Holiday 2011 Ultimate Beauty Kit onto the eyelid. Define the crease with a matte medium brown eyeshadow from the Pixi Holiday 2011 Ultimate Beauty Kit. Blend back and forth in a windshield motion with MAC 226 Small Tapered Blending Brush. Next, apply the Jealousness Waterproof Eyeliner in Smoked Black BK-II along the upper lashline. Curl your eyelashes, apply a coat of black mascara then a set of full lashes like Makeup For Life Lashes in Diva on top. Reapply your liquid eyeliner and make sure to fill in any gaps between your natural lashes and the fake lashes. Rim the lower waterline with MAC Fascinating Eye Kohl. Apply a pair of lower lashes like Makeup For Life Lashes in Cutie Pie. For Minnie’s bright red lips, first apply a bit of concealer around your lip line. Next, outline the shape of your lips with MAC Cherry Lip Pencil. Using a lip brush, apply MAC Russian Red Lipstick onto the lips then top with a red gloss from Pixi Holiday 2011 Ultimate Beauty Kit. See more of my Halloween looks! Where did you get the circle lenses? I love the anime vibe of this look! I would totally use those same lashes and lenses to do an anime cosplay! I got the lenses from overseas. They are EOS Peach Colour’s Adult Gray. Whre can i purchase Make up for life lashes? Unfortunately, I no longer sell the MUFL lashes but you can get some really similar styles at my store. Is there a specific style you are looking for?